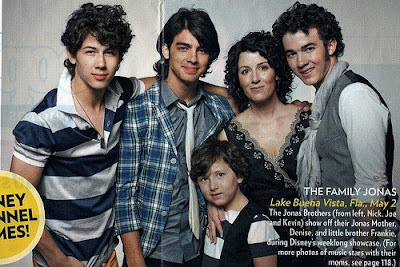 Denise Jonas, mom to famed Jonas Brothers, recently sat down with USA Weekend to talk about Nick’s diabetes diagnosis. After Nick’s diagnosis of Type 1 Diabetes, big bros Joe and Kevin looked after their lil bro on the road and were trained to do things like give Nick insulin shots or test his blood sugar, because they, not mom, would travel with him. Today, Nick has learned how to manage his diabetes. “He always has apple juice next to him on stage and backstage he has fruit snacks,” Denise shared. Check out the new Diabetes PSA that the JoBros and mom Denise will unveil nationally Monday! The Jonas Brothers we featured in so many articles since we can’t post it all, below is a link, check them out! Jonas Brothers Jet With Just Jared Jr. - Just Jared Jr.
TARRYTOWN, N.Y., Feb. 25 /PRNewswire/ — Today, Nick Jonas announced that Change for the Children, a charitable foundation started by the Jonas Brothers band, will provide $25,000 in scholarships to send underprivileged children with diabetes to diabetes camps. Nick, 16, who has had type 1 diabetes for over three years, shared the news of the scholarships at a Bayer employee meeting. The funds are made possible by a Bayer Diabetes Care unrestricted grant to the Change for the Children Foundation. “Nick has been a wonderful partner and we’re happy to support his efforts to raise funds through the Jonas Brothers’ Change for the Children Foundation,” said Nancy Katz, head of North America for Bayer Diabetes Care. As part of its ongoing support of Nick, Bayer hosted a fun-run at the meeting during which Bayer employees raised an additional $10,000 to be donated to The Change for the Children Foundation. The Change for the Children Foundation is a Jonas Brothers organization that provides support to charitable programs that motivate and inspire children to face adversity with confidence, determination and a will to succeed. Last year, Bayer and Nick Jonas announced their partnership to provide young people and their families with the motivation and support they need to help simplify life with diabetes. Together with Bayer, Nick is inspiring other young people with diabetes to achieve Simple Wins: small, everyday victories for managing the disease that can lead to big differences over time. As part of their partnership, Bayer and Nick are offering limited edition “dog tags” as a symbol of support for people with diabetes. 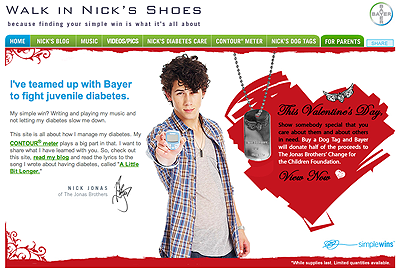 The dog tags feature a lyric from “A Little Bit Longer,” the song Nick wrote about his diabetes. To stay updated about ongoing programs, learn more about Nick’s personal experiences, purchase a dog tag and read his blog about his latest activities, visit www.NicksSimpleWins.com. Bayer Diabetes Care, a worldwide leader in diabetes, supports customers in 100 countries. Since 1941, Bayer has led the way in diabetes care product innovation with: reagent tablets, the first portable blood glucose meter and test strips, the measurement of A1C (glycated hemoglobin) with the A1CNow+ monitor, and the first suite of blood glucose monitors with No Coding(TM) technology (CONTOUR and BREEZE2) that today offer people with diabetes an unparalleled choice in diabetes management systems. Bayer Diabetes Care also offers comprehensive support to people with diabetes including education, tools and resources designed to simplify life with diabetes. Bayer HealthCare Diabetes Care global headquarters is located in Tarrytown, New York, in the United States and operates as part of Bayer HealthCare LLC, a member of the worldwide Bayer HealthCare group. For more information visit www.bayerdiabetes.com. Check out the cool Jonas Brothers poster that you’ll get when you go see their new flick this weekend! Thousands of theatergoers will be given posters featuring Kevin, Nick and Joe in their upcoming Disney Channel series JONAS — also starring Chelsea Staub and Nicole Anderson. The series premieres in May on Disney Channel. You can visit show’s official website at DisneyChannel.com! 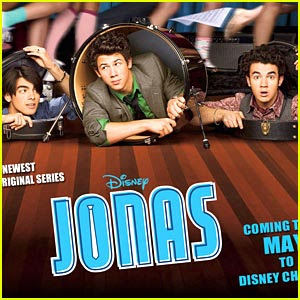 out tours to their forthcoming TV series and Disney Channel original movie Camp Rock, the Jonas Brothers have gone from obscurity to superstardom in the course of a year, and Kevin, Joe, and Nick are here to stay. This account chronicles their lives and careers, beginning with their days as child performers and their first disappointing Columbia Records deal and detailing how they were eventually signed by Disney’s Hollywood Records. 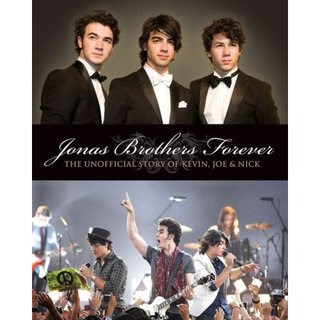 Jam-packed with photos, this is the only complete guide to the amazing world of the “JoBros”—the life and career of this talented trio; their family and the importance of their faith; their friends, girlfriends, costars, and management team; their albums, videos, tours, and TV shows—providing true-blue fans with an intimate portrait to remember. About the AuthorSusan Janic is the author of Living the Dream–Hannah Montana and Miley Cyrus: The Unofficial Story. She lives in New York City. ONE WEEK TO GO TILL THE MOVIE - LOTS PLANNED!!!! We are so excited to have all of you see our new JB 3D Concert Experience. It is only one week away and we cannot wait for you to see it and let us know what you think. OUR 3D MOVIE COMES OUT NEXT WEEK!!! 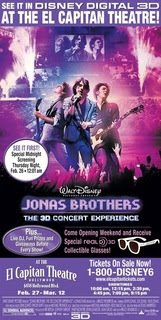 TUESDAY, FEBRUARY 24TH is the LA PREMIERE OF THE JONAS BROTHERS 3D CONCERT EXPERIENCE AT THE EL CAPITAN THEATER IN HOLLYWOOD. COME OUT AND SHOW YOUR SUPPORT IF YOU LIVE IN THE LA AREA. LA PREMIERE OF THE JONAS BROTHERS 3D CONCERT EXPERIENCE AT THE EL CAPITAN THEATER IN HOLLYWOOD. And the SOUNDTRACK for our 3D Movie comes out! SPOILER: Official "Love Is On Its Way" Music Video Teaser!! SPOILER ALERT: From actual movie, so don’t watch if you don’t want to spoil it. Despite what you may have read, the Jonas Brothers aren’t looking to branch out. Sure, they’ve already conquered the tween market, won the coveted “first daughter” demographic and made their first foray into feature-length 3-D films. But — contrary to several sources in the blogosphere — they’re not about to launch their own record label. 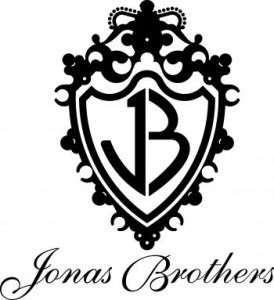 Late Wednesday, several sites noticed the launch of JonasGroup.com, a Web site featuring little more than a (slightly altered) version of the Jonas Brothers’ “JB” logo. Soon after, someone realized that the same logo appears on the back of Demi Lovato’s debut album, Don’t Forget. 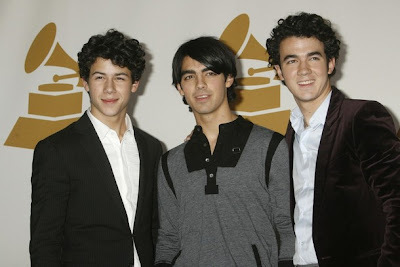 Couple that with several reports that the band had signed prep-rock act Honor Society, and suddenly, bloggy logic dictated that the Jonas Group was the Jonas Brothers’ brand-new record label. But, as is frequently the case with bloggy logic, it wasn’t exactly true. On Thursday (February 19), MTV News contacted a spokesperson for the Jonas Brothers, who let it be known that the Jonas Group isn’t a label at all … it’s a management company formed by the brothers’ father, Kevin, and longtime artist manager/ promoter Philip McIntyre. The spokesperson also added that the Jonas Group’s clients include not just the JoBros themselves, but Lovato (like it says in the liner notes of Don’t Forget, “Exclusive Management by: Philip McIntyre and Kevin Jonas for the Jonas Group”) and Honor Society too. And while, yes, the Jonas Brothers have signed Honor Society, it’s to a production deal, not a record contract. So, sorry Jonas fans. While there might be a movie and a TV show in the works, there’s no JoBros-owned record label on the horizon anytime soon. Pop stars can’t have everything, you know. Exclusively for Verizon Wireless customers, you can get the Jonas Brothers’ “Love Is On Its Way” as a ringback tone. The ringtone is not yet available! So make sure you support the boys and purchase it as your ringback tone (when people call you instead they hear the song)! If you can’t get it automatically through your fone, try the media store soon. ‘According to Denise Jonas during the Homeschool.com Live chat they had, the US Tour will be part of the World Tour. The US dates shall be announced soon (JB said before end of February, early March) and will be during summer, apparently they will start in the East Coast this time. The multi country tour dates for the World Tour will be then during Fall. We don’t have futher details yet, so please don’t email or ask us where they are going. An exclusive sneak preview of the soundtrack from the film. SPECIAL MESSAGE FROM JB KEVIN, JOE AND NICK! You guys ROCK! Over 6,500 of our amazing fans have signed up to host a house party this Saturday, February 21st at 11:00 am PST. We are excited for our LIVE web chat on Justin TV http://www.jonasbrothers.tv and can’t wait till next week when our movie comes out. Opening weekend for Jonas Brothers The 3D Concert Experience is going to be the biggest fan event ever! Thanks for helping us live our dream! Don’t Forget to Grab Your Tickets Now! Don’t forget to grab your tickets now (movie in IMAX theaters for one week only and midnight screenings now available!). Be the first to go with your friends to experience Jonas Brothers The 3D Concert Experience in a seat that is better than the front row! Make sure to check out FFE for house party tips and if you haven’t already, sign up to host your own house party (with parent’s approval of course!). House Parties, IMAX, Regular 3D Theaters, Midnight Screenings, and More! Sorry for the long blog today. We just have so much info to get to you. Hope you are all doing great today. We are sitting on the set of our TV show - JONAS. We are getting more and more excited each day. We cannot wait for you to see it. We also wanted to thank you for all of the encouraging comments. We have been working hard to get information out about the movie and it helps us so much to hear from you. You are the reason we love what we are doing. You always make it great! We wanted to fill you in on some special things happening in the next week or two. We just passed 6,000 house parties already signed up for this weekend. We cannot wait to hear how it goes for you. We look forward to your questions. Please check out www.fanfamilyexperience.com for more details. Make sure you check out all the info, including safety tips. WOW!!!! We just saw an early screening of the 3D CONCERT MOVIE at IMAX. It was UNBELIEVABLE! We heard that the movie is going to be in 55+ IMAX screens across the US. IT WILL ONLY BE IN IMAX THEATERS FOR ONE WEEK! You will want to get your tickets asap. The movie will open next Friday in 3D capable theaters all over the US and Canada. We are not sure how many weeks the movie will be in theaters. We have been hearing from people all over that they are excited to see the movie. We want to encourage you to gather your friends and plan for your viewing of the movie AS SOON AS POSSIBLE. YOU CAN GO TO WWW.FANDANGO.COM TO CHECK LOCAL SCREENINGS IN YOUR AREA. THERE IS A SPECIAL DOWNLOAD AVAILABLE FOR EVERYONE THAT BUYS A TICKET THROUGH FANDANGO. The following is a list of THURSDAY NIGHT, FEBRUARY 26TH - MIDNIGHT SCREENINGS throughout the US. Check for a city and screen near you!!! If your city and theater is not listed…Ask your local theater if there is a possibility of them adding a midnight screening in your area. TOP 10 SURPRISING FACTS ABOUT THE PURCHASE OF JB THE 3D CONCERT EXPERIENCE PRE-SALE TICKETS! 10. You can stay out past curfew if you see the midnight screening!! 9. You can beat everyone else and be one of the first in the theater, front row, staring at the Jonas Brothers! 8. What better way to spend your allowance?? 7. You can tell everyone on the FanFamily Experience website you’re going to watch the Jonas Brothers in 3D! 4. You can grab some candy and popcorn while everyone else waits in line. 3. You will KNOW that you’ll be able to experience the Jonas Brothers in a seat that is better than the front row! 2. You can buy tickets for multiple showings…that means multiple showings of your favorite band! 1. By buying your ticket early you know you won’t be missing out on the biggest fan event ever!!! Imagine tens of thousands of people trying to get into your school all at the same time — well, that is a bit like what happens during after-school hours on FFE. Massive amounts of amazing fans, just like you, are coming to FFE to view clips, meet friends, post questions, and organize their house parties. That means FFE sometimes slows down. You can be sure that TEAM FFE is doing everything we can to make it faster. Thanks for your patience. And, as always, feel free to send us your comments. We read each and every one. They want you, the fans, to make the 3D Movie premiere to be one of the biggest fan events ever! Jonas Brothers New Record Label? Honor Society 1st Band Signed? Honor Society drummer Alexander Noyes told PIX News right before taking the stage in Irving Plaza:‘Tonight, I think, is kinda like the coming out party.’ The performance coincided with a surprise appearance by Jonas Brothers..
..who announced that Honor Society will be the first band signed to their new record label. Honor Society’s debut album is coming out very soon. Interesting..
Just a reminder that once you complete the sign-up form, we will be reviewing the sign-up to make sure all the information is complete … and then we will be awarding your Impact Score. Thanks for your patience! And thanks again for signing-up! Also, make sure you log into your FFE account and make sure to download all of the details about the information on how to throw a pre Jonas Brothers 3D Movie house party. Preview of Tommorow's Ellen Show with the Jonas Brothers! The Jonas Brothers were featured at the number six spot for Yahoo! Top Searches for February 14th. 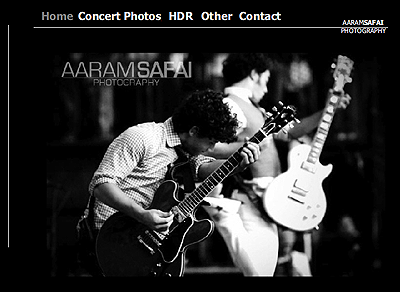 Nick Jonas and Kevin Jonas are the main subjects on AARAMSAFAI Photography homepage. You can check out his concert photos, website by clicking here. Nick Jonas was freaked on this week’s People.com’s Star Tracks for February 13th. 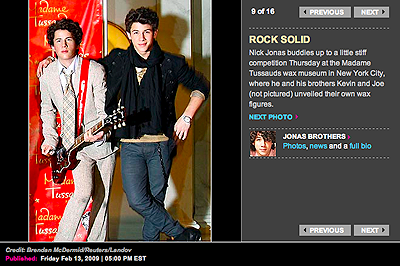 It was a photo of Nick Jonas standing next to the wax figure of himself in New York when unveiling the statues. You can click here to view the details the rest of the photos from People.com. On The Ellen DeGeneres Show website, they put up the episode summary of what will happen on Tuesday. The Jonas Brothers will be playing “blindfold musical chairs“. Special Opening Day — FAN APPRECIATION GIFT — Exclusively at the El Capitan Theatre in Hollywood!! See the movie at the El Capitan Theatre in Hollywood on opening day — Friday, February 27th — and get a special signed and dated commemorative photograph of the Jonas Brothers! The exclusive commemorative photo is only available on opening day, starting with the first show at 12:01am (Midnight) Thursday night, February 26th! Yesterday, JJJ got to hang out with the Jonas Brothers as they taped their MTV special, The Jonas Brothers Experience. You can tune in Monday, February 16 @ 6PM ET/PT. 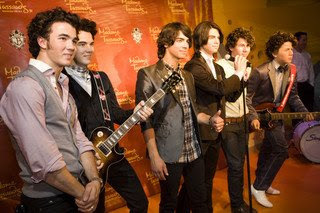 The show taped at New York City’s 30 Rockerfeller Center (30 Rock), where some of their biggest fans competed for a trip to the worldwide premiere of their new movie, Jonas Brothers: The 3D Concert Experience. The JB fans caused such a ruckus from jumping up and down, employees up to five floors below the taping thought there was an EARTHQUAKE. Some even evacuated the building and ran down 60 flights of stairs. OMJ!!!!!!!!!!!!! FYI: There was a tie-breaker question on the show. “Three of the Jonas Brothers concerts took place at NYC’s Madison Square Garden on August 9, 10, 11. What was the total number of fans from all three dates?” Click inside to find out the answer… And don’t forget the JoBros are performing on SNL tonight!!!! Hey! Check out these spectacular promo vids where the Jonas Brothers promote their new movie and wish you a Happy Valentine's Day! 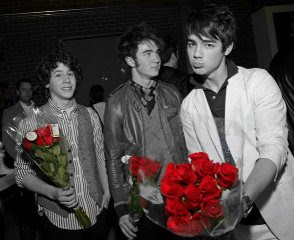 Jonas Brothers Wish You A Happy Valentine's Day! Don’t for get to check your listings for JB’s performance/appearance on Saturday Night Live tonight! I don’t know about you guys, but everyone at JB Fandemonium is super excited. We are SO proud of them and we wish them the best of luck. And who knows, maybe they will appear in a skit.. How cool would that be? JBF Question: What song do you want them to perform tonight? The Jonas Brothers have captured the hearts of many devoted fans – but the heartthrob musicians only have eyes for Alec Baldwin this Valentine’s Day. The Brothers, who rocked the Grammy stage with Stevie Wonder last weekend, are primed for their first-ever Saturday Night Live appearance on Saturday. The show will be hosted by Baldwin. The Jonas Brothers, who of course plan to sing, confess to PEOPLE that they are secretly hoping to get the chance to appear in a sketch with Baldwin. Tune in Saturday to see if the Jonas Bros. get their wish. House Party Web Chat Feb. 21! We have some exciting news. We are going to be having an exclusive web chat for everyone that will be hosting a house party on Saturday, February 21st. What is a house party? Check out FanFamilyExperience.com for our exclusive video talking about house parites and how you can make opening weekend of our new movie, Jonas Brothers The 3D Concert Experience, the biggest fan event ever! Don't forget to watch the Jonas Brothers tonight on Saturday Night Live for a Valentine's Day Spectacular! Kevin, Joe and Nick are looking for house party hosts! Check out their new video just for you! Movie Set has a bunch of videos that are behind the scenes for the Jonas Brothers: The 3D Concert Experience. Some videos might be little spoilers for those who didn’t watch. You can view them by clicking here. Jonas Brothers backup band forming their own band? Bulldozer, composed of John Taylor: Triangle/ Vocals, Greg ‘Garbo’ Garbowsky: Kazoo, Jack ‘Flawless’ Lawless: Tambourine/ Banjo Ryan Liestman: Vocals/ Accordion. Thx MendozaSisters! "What were you looking forward to in 2009?" Looks like the majority of you want to see them on their new world tour, eh? Thanks again for voting and watch out for the next poll!!! 4. The Police: $109, million 5. Celine Dion: $99,171,237 6. Kenny Chesney: $90 7. Neil Diamond: $82 8. Rascal Flatts: $63 million 9. Jonas Brothers: $62 million 9. Coldplay: $62 million. January was a busy month but February is going to be even more fun! In January, we presented at the Golden Globe Awards and had the honor of performing at The Kids Ball in Washington for President Obama’s Inauguration. All of Washington was buzzing with excitement that week and we were glad that we were able to be a part of it. The schedule that we keep is just another reason being in control of my diabetes is so important to me. Bayer and their Contour meter help me achieve that goal everyday. This month my brothers and I have a lot of “firsts” planned. The Grammys were this month. We performed, but are even more thrilled that we were nominated! Both things are really a dream come true. Did you enjoy our performance with Stevie Wonder? It was truly an honor to grace the stage with such a living legend. On February 14th we will be performing on Saturday Night Live. Most of that week actually we will be in NYC doing press letting everyone know about our 3D movie which comes out February 27th. This month will round out with lots of promo for the premiere of our 3D Movie, continuing to record our TV series, JONAS, appearing in the Barbara Walters Oscar Night Special and much more. Have you decided where you are going to see the 3D Movie? Remember it comes out the 27th! I hope that you enjoy it. My Simple Win this month? Being able to manage my diabetes well enough to be performing at the Grammys and premiering our 3D Movie! The Jonas Brothers are adding “co-host” to their list of many talents. On Thursday, Feb. 12, the band will share the stage with Entertainment Tonight’s Mary Hart and The Insider’s Lara Spencer as c0-hosts for the day. The boys will also sit down for an in-depth interview where they reveal everything from their secret Valentine to the intimate details of their lives on tour. So who is the special lady this year? “Mom!” all three brothers tell ET and The Insider. With such busy lives, it seems mom is the only one who can keep up with the band this year. Kevin, Nick and Joe tell Mary Hart and 75 lucky fans that life on tour is different for all of them. Tune in tomorrow to find out what those nicknames mean! We know it’s peaked our interest! 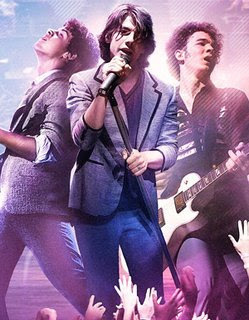 The Jonas Brothers: The 3D Concert Experience opens in theaters on Feb. 27. 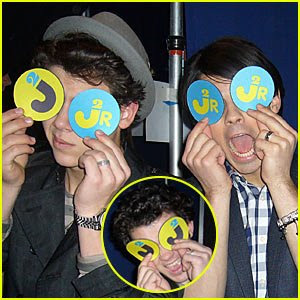 Now, the JoBros are hoping to join the two red-hot franchises together. “That would be really cool,” agreed Joe and Kevin. In November, the “Twilight” soundtrack opened in the top slot of the Billboard albums chart and continued its strong sales throughout the film’s box-office run. Staying true to Meyer’s close relationship with music — and director Catherine Hardwicke’s love for mixing her images with disparate tunes — the soundtrack featured such diverse bands as Paramore, Perry Farrell, Linkin Park and Collective Soul. These days, after selling millions of albums all over the world, the JoBros are charting a course that will allow them to make their mark on the big screen. This month’s 3-D concert flick will mark their movie debut, followed by the Farrelly Brothers’ “Walter the Farting Dog.” The JoBros are quite aware that a “Twilight” song could endear them to a huge movie audience and insist that, despite the claims of some haters (like Stephen King), the tale of Edward and Bella isn’t only for girls. Edward and his Cullen family are so popular, in fact, that “Twilight” recently proved its power as a franchise by distracting screaming teens long enough for the JoBros to grab a pizza. “I think this is really funny,” Kevin remembered of the first time the trio realized how huge “Twilight” was. “We were in town [the day of the 'Twilight' premiere], because we were working all day on our TV show. Earn the Top Impact Score in Your State! … and you will get a signed Jonas Brothers 3D movie poster! Even though you may not have the highest Impact Score overall (yet!) you can still earn great prizes! You have until March 1st! Great job everyone! Joe Jonas shirtless in 3D Movie! WE want to thank everyone for the wonderful comments. It was amazing to be on stage performing with Stevie Wonder. We have listened to his music for our entire lives. We still can’t believe that we were on that stage singing and playing music with one of the biggest icons in music. We are honored and still thinking about it constantly. Thank you Stevie Wonder and everyone that helped make it possible. We were really living the dream. We did not win the Best New Artist but you have made us feel like we won. We are happy for Adele. She is amazing and we love her music. Today we spent most of the day doing press for the 3D MOVIE. We did a lot of interviews. You should be seeing some of it in the near future. Tomorrow night we will be hosting the CW to promote the 3D MOVIE. Tomorrow we are visiting Jimmy Kimmel, Entertainment Tonight and Insider, and Ellen (some of it is being taped for later). SATURDAY NIGHT LIVE on February 14th!!!! Our PREMIERE for the 3D Movie is scheduled for Tuesday, February 24th at the El Capitan Theater in Hollywood. Hope we see you there! Come show your support. Once again, thank you for all the support and encouragement. We are so excited and thrilled for the things that are coming. Madame Tussauds New York, the famed Times Square wax attraction, invites you to be a part of the excitement as the Jonas Brothers unveil their wax figures on Thursday, February 12th. The first 75 fans to arrive at Madame Tussauds the morning of the unveiling will be invited inside to see the Jonas Brothers and be among the first to check out their incredible wax likenesses. For more information, visit www.nycwax.com or call 1-800-246-8872. TIME: Get there early!!! Only the first 75 fans will be invited inside. Figure unveiling to take place at 11:00 a.m.
Can’t make it to New York on February 12th? No problem! The Jonas Brothers’ figures will be on display in New York until May. PLUS – on February 27, the Jonas Brothers will head to the big screen in Disney Digital 3-D™ with “Jonas Brothers: The 3D Concert Experience.” This high-energy Walt Disney Pictures rockumentary feature film event blends excerpts from the Brothers’ sold-out “Burning Up” concert tour, with exclusive behind-the-scenes footage, off-the-wall segments, a never-before-heard song, swarming fans and a lot of JB-style humor – giving fans never-before-seen insights into the lives of Kevin, Joe and Nick. Jonas Brothers - The Movie - 3D Concert Experience!!! ET’s Mary Hart welcomes some new co-hosts to ET and their names are Nick, Joe and Kevin Jonas. On Thursday’s show, it’s the Jonas Brothers like you’ve never seen them before as they take over the ET stage! Don’t miss Thursday’s ET to see all the fun and friendship behind this sibling boy band. 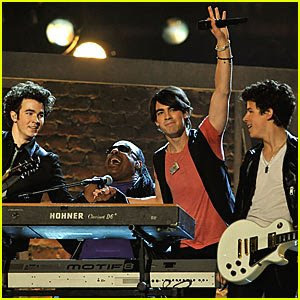 The Jonas Brothers jam to their hit song “Burnin’ Up” with the legendary Stevie Wonder at the 2009 Grammy Awards held at the Staples Center on Sunday in Los Angeles. The musical trio also performed Stevie’s classic, “Superstition.” FYI: In September, the Jonas Brothers performed at the birthday party of Stevie Wonder’s 7-year-old son, Kailand..
Nick, 16, wore David Yurman jewels and donned a Dior t-shirt, jacket and jeans. Joe, 19, wore a ripped Requel Allegra shirt, a blingin’ Avakian necklace and Dior vest and jeans. Kevin, 21, kept it cool in a Balenciaga jacket, Platinum jewels an Dior jeans and shirt. On the red carpet, Nick suited up in a Burberry suit and Neil Lane accessories. Joe wore a sparkly Versace suit with David Yurman jewels. Kevin also wore Versace with a David Yurman watch and Platinum accessories. Kids will be able to cast their vote online at http://www.nick.com/kca beginning Monday, March 2 in a total of 18 categories. Surprise awards also will be announced during the show. Kids also will be able to vote via the Nick mobile website (wap.nick.com). Beginning Monday-Friday, March 2-6, a different category will be featured on-air each day, and kids again vote for their favorite online at Nick.com. ‘Candy Land’…the movie? What’s next, ‘Hungry Hungry Hippos: The Motion Picture’? On The Ellen DeGeneres Show, they will have a Monday (February 9th) Grammy Special. The Jonas Brothers are set to be featured somehow (no not as actual guests). So tune in! Here is the latest Say Now Message from the Jonas Brothers! Sad news, Disney Channel fans: There will be no Disney Channel Games in Orlando — or anywhere this year. The channel is putting its emphasis elsewhere. Last month, Disney Channel honcho Gary Marsh said the young stars’ busy schedules could scuttle the games this year. If you are part of the JonasBrothers.com’s JONAS Street Team. Make sure you login into your account and go to Missions. There is a new mission there that can help you WIN AN AUTOGRAPHED “A Little Bit Longer” ALBUM! So you don’t want to miss out! GO BUY YOUR 3D MOVIE TICKETS TODAY! 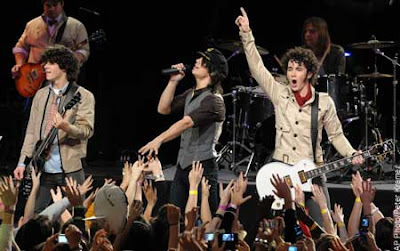 February 3, 2009 (Burbank, California) - The Jonas Brothers will act as hosts for a night of The CW’s hit series 90210 and Privileged on Tuesday, February 10 (8:00-10:00 p.m. ET), and will offer a sneak peek of their new film, “Jonas Brothers: The 3D Concert Experience,” in theaters February 27. Hey everyone! Tomorrow is a big day for us. Pre-sale tickets to our movie, JONAS BROTHERS THE 3D CONCERT EXPERIENCE, will soon be available online! Tomorrow, you can use the ticket widget to find showtimes for the film in your area. If you pre-order movie tickets on fandango.com and movietickets.com, you’ll get an iTunes download of our BRAND NEW music video, “Tonight,” for FREE! We are so excited and want for you and your friends to see the movie and to make our 3D Release the BIGGEST FAN EVENT IN HISTORY! Starting tomorrow, you can pre-order our NEW SONG Love is on its Way, plus live performances from Taylor and Demi on iTunes! Thank you so much! We appreciate your love and support and we can’t wait for you to see the movie! Great job everyone! The first FFE project ends at midnight PST on Sunday, March 1! Check out new actions, more on the FFE Community Week, exclusive content, and details on how the Impact Score works — all coming very soon! Hey everyone! Thank you for doing such a great job recruiting your friends to join FanFamily Experience! You are awesome! Today kicks off our official Community FanFamily Week. We want to know you better and want you to know each other better. One of the ways to do that is to encourage even more of your friends to join the FanFamily Experience and build groups with your friends! We will continue to check out everything you are doing online this week and are excited to get to know you better. Just in case you haven't bought your tickets yet . . . If you haven’t, BUY IN ADVANCE and guess what, we have a new referral offer, if you buy your tickets now before March, you can get a FREE DOWNLOAD code to get the Jonas Brothers’ “Tonight” music video off iTunes! That can’t get any better… advance tickets, no lines, and a free download for the music video! Go ahead and click here to buy your tickets NOW! on Saturday, February 14th, 2009 (YES, Valentine’s Day) in NEW YORK CITY!!! We were raised loving this show and we are so honored and excited to be a part of the show in this special year. Change for the Children: Get Updates Through Texts! The Jonas Brothers have a new section to their Change for the Children website. They took down the promotional video on the homepage to announce their new “text program“. This allows you to receive text updates about the charity and also volunteer work in your community that help raise money for charities and as well help the Jonas Brothers’ foundation. You can get more information about the program by clicking here. If all can apply, it’s not harmful to sign up (if younger than 13 get parent’s permission & everyone should check your cell phone plans). On February 12th, the Jonas Brothers will help unveil their wax figures at Madame Tussauds in Times Square in New York! The first 75 fans to arrive on the day of the unveiling will have the chance to see the Jonas Brothers and be some of the first to see and pose with their wax figures. If you can’t make it on the 12th, no need to worry! The figures will be on display until May.